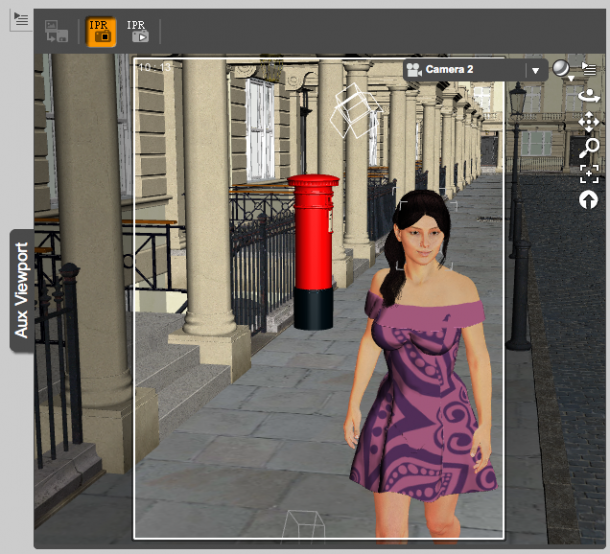 DAZ Studio 4.7 introduced an auxiliary viewport option with an Interactive Preview Render feature. This is a new panel that can be docked anywhere in your workspace (or free-floating if you prefer). You can find it under Window – Panes (Tabs) – Aux Viewport. It looks and works much like the ordinary viewport in the middle, but at first glance it seems to have less options. Observe please: hover over the Aux Viewport to see the familiar camera selection and drawing style appear – they’re just hidden to clean up the interface when no mouse is in the vicinity. Very handy! The Aux Viewport serves to helpful functions: you can see a small preview of what’s framed in your final render, and you can see exactly what it will look like when rendered. I like to switch on the Aspect Frame in the Aux Viewport and switch it off in my main viewport. I also select my main rendering camera in the Aux Viewport and switch cameras to position objects in the main viewport – always keeping an eye on what my final render composition looks like. Right now the drawing style in both viewports looks the same (texture shaded in the above example), but the big problem is that it does not accurately represent how my render will look like – especially in regards to lighting. What we see right now are preview lights drawn with OpenGL, but when we press that big “render” button, the result will look very different. That’s why the Interactie Preview Render function was introduced. See that little playback button at the top right of the Aux Viewport? Click it and you’ll see the Aux Viewport start to transform into a preview render – in a fraction of the time it takes to create the “real render”. Depending on the speed of your system and the complexity of your scene this can take a second, but it happens on a background thread so you can keep working while this window becomes clearer in a few moments. What’s even better is that you can make changes to your lighting and see those updates in the window as you go along. No need to wait 5 minutes for a “real render” to finish (after which you’ve forgotten what you’ve actually changed). Notice how the IPR updates when you make a lighting change: not the entire scene is rendered again, but only the parts that need to be updated. It’s ingenious! So go and fine-tune that UberEnvironment, the Rim Light, the front Spot Light, play with the direction of the sunlight – and within seconds you’ll see what a difference your change has made. It works almost in real time. The IPR is not perfect though, and ultimately the “real render” may differ slightly from the preview. For example, updating subtle poses or moving small objects are not always reflected. In those cases, switch the IPR off and on again. On the whole it does work well, and if it gets in the way while recalculating every few seconds you can always switch it off until you want to see updates again. If you find that the low resolution is fine for preview purposes while you let your system work on a larger version, you can press the button on the far right in the Aux Viewport to save the preview render (hover to find that it says “Save IPR Render”). It will save the last iteration it was working on, even if you switch the IPR off. The size of the image depends on how big your Aux Viewport was at the time of the last preview render in your workspace. Does the IPR work with NVIDIA Iray? As of DAZ Studio 4.8, the Interactive Preview Renderer only works with the 3Delight engine and not yet with the new NVIDIA Iray engine. 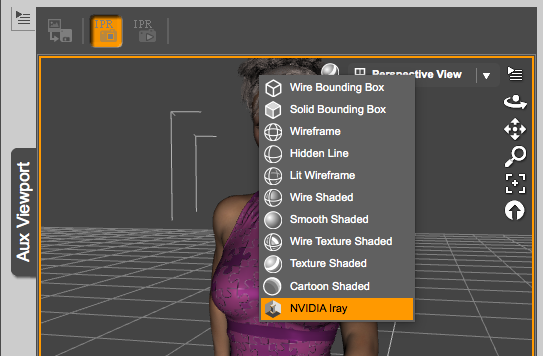 As of DAZ Studio 4.9, you CAN use the Aux Viewport as rendered Iray Preview: simply change the default draw settings from “texture shaded” to “NVIDIA Iray”. You can do that with any viewport. 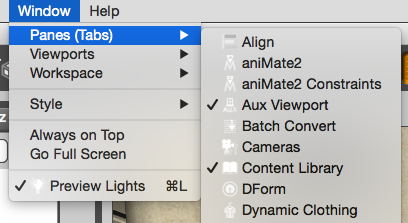 The draw settings icon is the one right of the view port / camera selection menu.